We've seen an ever-increasing push for decision support tools as a part of digital sales strategy in every industry, not just healthcare. These tools help consumers demystify the product selection experience by cutting through jargon and complicated plan structures to help find the right plan for their needs. These tools take on a variety of forms, based on industry, and typically revolve around the key differentiators for the product and/or value drivers for the consumer. Provider lookup: allows consumer to verify their physician or local hospital is part of the network. Drug lookup: verifies their medications are covered and lists the copay amount. Cost estimator: compares out-of-pocket estimates across plans. These take on a ton of different forms and are especially important for plans tied to a Spending Account. Benefit comparisons: shows differing benefits provided by the plans (example: are chiropractors covered under one but not the other). Scenario planning: models cost options for specific scenarios (an elective surgery, birth) across plans. Explanation of coverage: walks the consumer through how the Premium, Deductible, Coinsurance, Copays and Out-of-Pocket max interrelate to determine how much the consumer has to pay. Is this enough? Are we missing the mark? Providing tools to consumers implies that the customer has both the ability and the motivation to learn. If you break that down into a quadrant analysis, that’s only one of four quadrants. 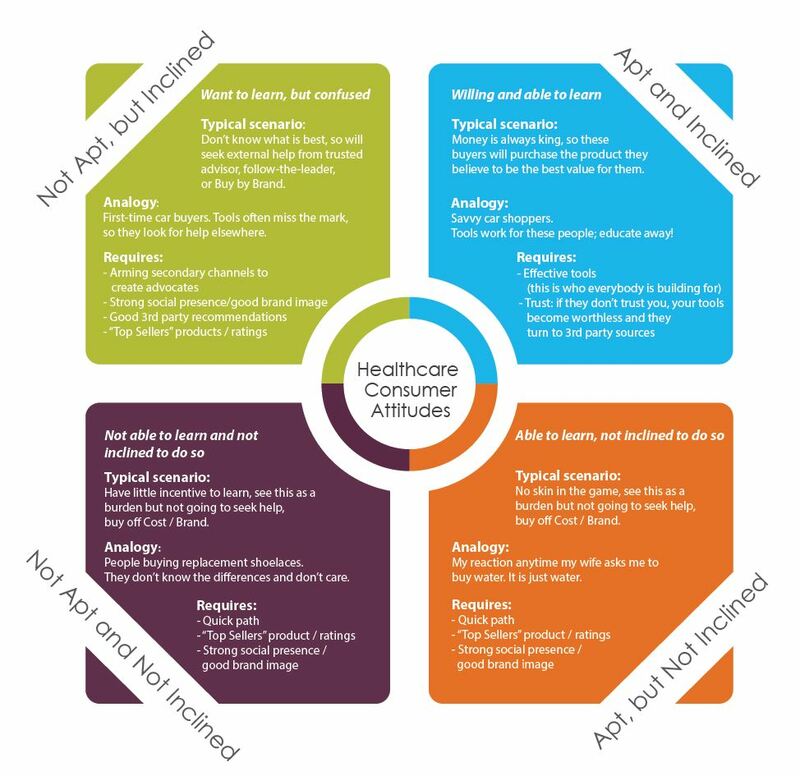 I view the health plan sales marketplace in four quadrants. Each requires a different approach to help drive conversions. Before moving on to tactics, we need to define the axis. What is the customer’s motivation to learn? You can’t teach the unwilling, so what is their desire to take advantage of the tools before them to understand your product offerings? Inclination to learn increases as the customer has more skin in the game. The more out-of-pocket or cost sharing involved, the more apt they are to take action. Desire is only half the equation. 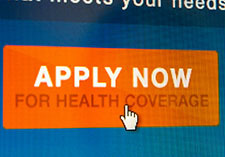 Do they have the capacity to understand the complexities of health plan designs? The harsh reality is that not everyone can understand the often confusing nature of how health insurance works. We can lower the bar through intuitive tools, simplified language and access to assistance, but there is a ceiling. It's important to develop digital tools and tactics that can help you reach customers in all four quadrants. Check out how we have helped our clients build customer-facing decision support tools and sales support iPad apps.